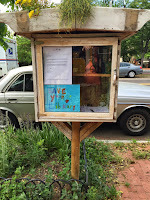 His creation is part of a trend, one of several so-called original little free libraries around town - and around the world, according to the website littlefreelibrary.org that has taken the trend to heart and turned it into a cause. Its heart worthy mission being to redistribute books to people in need. 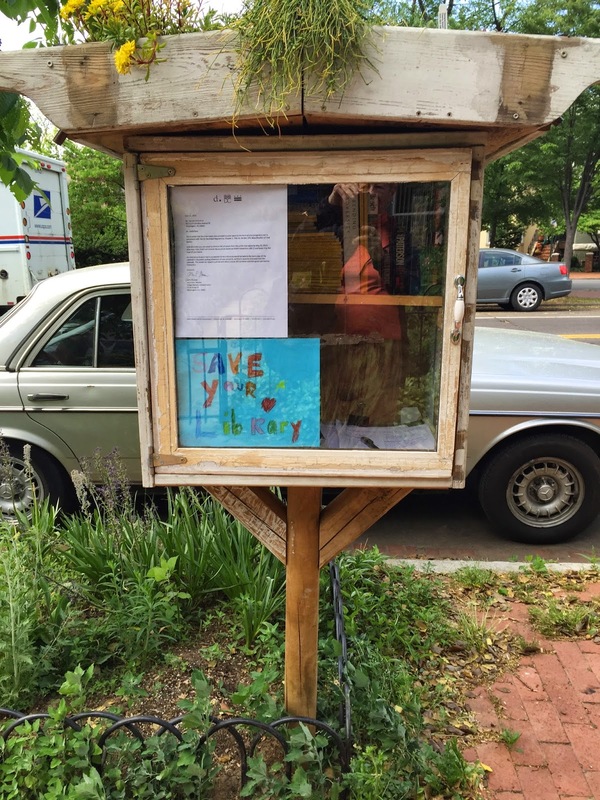 In May a Little Free Library Big Book Access Campaign was on Kickstarter soliciting $50,000 in funds. Alas for noble deeds, however worthwhile. Ingenuity does not always square with city rules for "Beautification of Tree Spaces." Mr. deStephano one day found a note posted in his name on official stationery attached to the door. John Thomas, associate director of the D.C. Urban Forestry Commission wasn't pleased with this bit of folk art; he considered it a transgressor on public ground, defacing the area around and under the young tree growing beside it. He judged it "Not in compliance with the D.C. Municipal Regulation Chapter I, Title 24, Section 109." What constitutes a better more useful urban tree box is anyone's guess but it certainly does not include candy wrappers, empty bottles and assorted other detritus that ill-mannered citizens often toss into those weed-infested lots. Mr. Thomas suggested moving the library behind "the back edge of the sidewalk in the parking dimension of your property. This will not require a permit." Parking dimension? Is that another rule we need to know about to live civilly in the city? Does that mean Mr. deStefano can apply for a permit to keep the library in its present position? The result was a petition of redress by the community. Signatures and email addresses to 'Save Your Library" filled sheets of paper inside in protest, next to works by William Golding, Machiavelli, Alexander McCall Smith, J.D. Salinger, and others, as well as old copies of National Geographic and a 2015 calendar labeled a Consumer Guide to Pasture Based Meats and Dairy. The public had spoken. No further word from Mr. Thomas. The structure was still in place in mid-July.